If you are in Nashik, you cant just miss the Trimbakeshwar Temple. One of the most famous temples dedicated to Lord Shiva. I am sure majority of people have probably visited Nashik to visit the Trimbakeshwar temple and not vice versa. But there is one place in Nashik, which very few know about. It is called the Anjaneri Caves. Anjani was the the name of Lord Hanuman's Mother. Anjaneri Caves is the birthplace of Lord Hanuman and is situated atop a picturesque hill. You need to trek for more than two hours to reach this place. 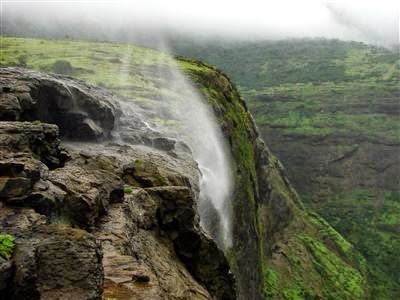 This place is a favourite among trekkers because of the Reverse Waterfalls at Anjaneri. The force of the wind near these waterfalls is so strong that the waterfall flows against the law of gravity. See below. Husband and I being ill, decided to skip the trek, but we visited the Anjaneri temple at the foot of the hill. I was really excited to visit this temple, because I have visited temples dedicated to Lord Hanuman but never heard of anything dedicated to his mom. Didn't I tell you..Sarees are fit for Godesseses? I have been to Trimbakeshwar temple as a kid because I had to do a major pooja there. Loved the place and remember that it was very peaceful. Wonder if it still that peaceful? It is crowded, but still peaceful. Yeah..isnt it amazing. Thats y i had to share it. This is a good post. Very informative. Thanks for this post which brought in some good old memories..I visited this temple six years ago..